Sales organizations are challenged to meet the business and emotional needs of prospects and clients with the evolution of today’s sophisticated buyer. SalesKey® provides the tools necessary to conduct more meaningful conversations and maximize the potential of each opportunity. Our turnkey assessment programs are designed to enhance the selection strategy and help provide candidates with attributes that are essential for successful sales and service associates. ProficiencyMaster® uses certainty based learning to ensure the understanding of key sales and service concepts. CoachVue™ allows senior management to track and monitor the progress and effectiveness of frontline management coaching conversations with sales and service associates. Employee’s psychological and behavioral competency can be difficult to evaluate. With our expertise and proven tools and programs, we solve productivity-lowering problems. Research drives what we do. Turn to Research Based Solutions when you want the facts as well as the tools to improve productivity. Dr. Dave Barnett’s Four Level Model is a breakthrough in the field of sales productivity and has enabled not only the behavioral analysis of customer service, but also the exploration of the inherent relationships between sales and service in proactive business environments. Research Based Solutions combines sophisticated online assessments, tracking tools, online self-managed learning and proficiency building, with one-on-one specialized skills development by Research Based Solutions certified coaches. Our mission is to enable your company to hire smarter, train faster and retain longer. Research Based Solutions identifies and measures specific behaviors statistically proven to help sales and service reps, managers & human resource staff maximize potential in both Sales and Service sectors. We do this in two ways. We identify fundamental behaviors that are generally not cost effective to train and coach, therefore enabling more efficient hiring and correctly positioning existing personnel. Secondly, we develop and coach, at both the associate and management level. As a result, we are a catalyst for creating sustained measurable performance gains, increasing productivity in low, middle and top performers, and developing ‘in house’ manager resources. 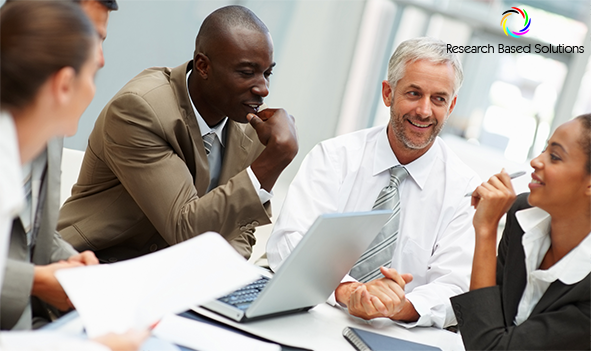 Research Based Solutions works with companies that desire increased productivity within their sales and service teams. Our approach has enabled sales organizations to increase bottom line sales and service organizations to improve their CSI scores (Customer Satisfaction Index). We promote learning by providing one-on-one coaching and train-the-trainer programs to implement enterprise-wide performance mentoring. Our programs are deployed quickly and intuitively, delivering measurable change from the first day of implementation. How do we differentiate our customer experience from our competition effectively? How do we connect with buyers more efficiently? How do we shorten our sales cycles? Customers today are more sophisticated. It is important that sales organizations meet not only the business need but connect emotionally with the customer to win their loyalty. The importance of understanding the relevant rhythm of activity within individual sales organizations. Research Based Solutions works with sales organizations to develop a sales dialogue, so that selling styles are tailored to the buying behaviors of the customer. Research Based Solutions is a corporate training firm founded on the belief that there was a better way to analyze a company’s sales and to manage sales teams. Utilizing a behavior-based, analytically-driven approach, Research Based Solutions trains management and sales/customer service personnel on how to achieve productivity gains. “We focus our training on understanding the importance of activity management, and the impact emotional intelligence has on the buying decision,” explained Matt Robbinson, Research Based Solutions CEO. “Our approach utilizes data, metrics, emotionally-driven behavior and sales principles to generate results." Research Based Solutions also offers sales/call center management a prescriptive approach to managing and developing sales and customer service teams. Providing practical solutions for achieving productivity gains, they remove the guesswork for managers and gives them a reliable, tested approach that brings accountability. Most sales training trains individuals on techniques to improve sales, but Research Based Solutions combines the behavior-based, analytically-driven science of sales management with the art of selling. By changing sales/service personnel behaviors, clients experience improved and sustained performance gains. Research Based Solutions’ extensive customer base consists predominantly of financial services companies, professional services, technology, manufacturing and distribution, and businesses with call centers. With a presence in Boston, Dallas, Salt Lake City and Phoenix and headquartered in Chesterfield, the company is focusing its growth efforts in the St. Louis and Kansas City markets.